Hey everyone! 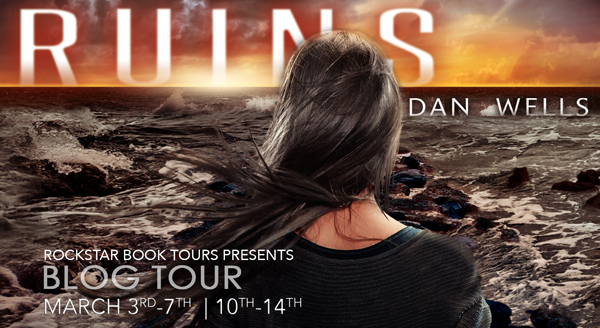 We are super excited to announce the hosts and schedule for Dan Wells's RUINS Blog Tour. The tour runs for two weeks, from March 3rd-7th and 10th-14th, and consists of a timeline scavenger hunt! Have you always wanted to know what happened before the Partials War? Well Dan has given us an awesome timeline to share across the 10 tour stops! There will also be a tour-wide giveaway for a prize pack of 2 signed sets of Dan's Books and T-shirts! We can't wait for RUINS to release on March 11th and for the tour to begin on the 3rd! Feel free to grab this awesome badge designed by Parajunkee Design to post in your sidebar! Kira, Samm, and Marcus fight to prevent a final war between Partials and humans in the gripping final installment in the Partials Sequence, a series that combines the thrilling action of The Hunger Games with the provocative themes of Blade Runner and The Stand. There is no avoiding it—the war to decide the fate of both humans and Partials is at hand. Both sides hold in their possession a weapon that could destroy the other, and Kira Walker has precious little time to prevent that from happening. She has one chance to save both species and the world with them, but it will only come at great personal cost.